ESA awards Emily E. Ernst with the Forest Shreve award. Named for Dr. Shreve, an internationally known American botanist, the award supplies financial support to ecologically research by graduate or undergraduate student members of ESA. Ernst is a PhD candidate studying Ecology & Evolutionary Biology at Iowa State University working under the mentorship of Dr. Kirk Moloney. 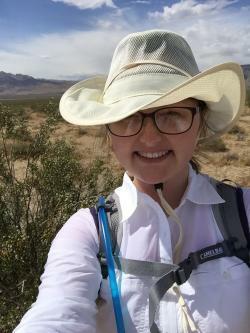 She is studying two problematic exotic grasses of the Sonoran and Mojave deserts, Schismus arabicus and Bromus rubens, and how the microhabitats beneath creosote bush may affect the distributions of these invaders. She is also investigating how their invasion may affect the pathways for potential desert fires to spread. She will use her award to better characterize microhabitat soil nutrient and water availability.